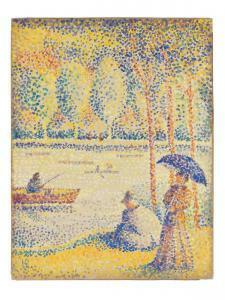 Find artworks, auction results, sale prices and pictures of Hippolyte Petitjean at auctions worldwide. 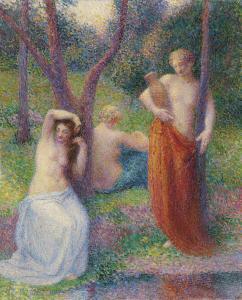 Hippolyte Petitjean (1854-1929) Après le bain signed and dated 'hipp. Petitjean 1917' (lower left) oil on canvas 28 7/8 x 23 1/4 in. 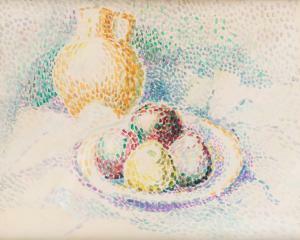 (73.5 x 59 cm.) Painted in 1917 Provenance Anonymous sale, Christie's, New York, 16 May 1990, lot 359. 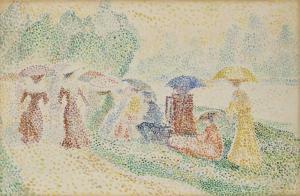 Anonymous sale, Sotheby's, New York, 14 May 1998, lot 410. Acquired at the above sale by the present owner. Hippolyte, Petitjean 1854 Mâcon, Frankreich - 1929 Paris Bords de Seine No. 1 Aquarell auf Papier auf Karton aufgezogen 31,4 x 47,9 cm Links und rechts unten mit rotem Stempel 'Atelier Hipp. Petitjean' (Lugt 2022c). Verso in Bleistift betitelt, mit Pariser und Kölner Zollstempeln und mit Etikett von Arthur Lénars & Co., Agents en douane, Paris. Verso auf Unterlagekarton mit Ausstellungsetikett von Abels Galerie, Köln. Unter Glas gerahmt. Provenienz: Privatsammlung Rheinland Ausstellung: Abels Galerie, Köln 1959, Kat.-Nr. 2 Hippolyte, Petitjean Bords de Seine No. 1 Watercolour on paper mounted on cardboard 31.4 x 47.9 cm Lower left and right corners bear red stamp 'Atelier Hipp. Petitjean' (Lugt 2022c). Titled on verso in pencil, with Parisian and Cologne customs stamps and with label by Arthur Lénars & Co., Agents en douane, Paris. Verso has exhibition label on card underlay from Abels Gallery, Cologne. Framed under glass. Provenance: private collection, Rhineland. Hippolyte Petitjean (1854-1929) Barques sur le canal signed with the artist's monogram (lower left) gouache and pencil on board 34 x 26cm (13 3/8 x 10 1/4in). Footnotes The authenticity of this work has kindly been confirmed by Monsieur Stéphane Kempa. Provenance Zeiger Collection. Anon. sale, Joigny Enchères, Joigny, 27 January 2013, lot 148. Private collection, France (acquired at the above sale). Exhibited Paris, Galerie René Drouin, Maîtres et petits maîtres du XIXe siècle, October 1942. Hippolyte Petitjean (1854-1929) Nu au voile signed '.hipp. Petitjean' (lower left) oil on canvas 32 ¼ x 18 ½ in. (82 x 47.2 cm.) Painted circa 1890-1892 Provenance Anon. sale, Hôtel des ventes, Neuilly, 19 April 1984, lot 28. Anon. sale, Maître Yves Manson, Rennes, 8 April 1990, lot 96. 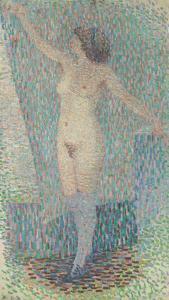 Private collection, France (acquired at the above sale); sale, Sotheby's, London, 22 October 2002, lot 119. Acquired at the above sale by the present owner.